Students whose parents didn’t finish high school score about 15% below average and about 25% lower than students whose parents hold graduate degrees. Students whose parents finished high school but didn’t earn a college degree, score about 10% below average and about 20% lower than students whose parents hold graduate degrees. 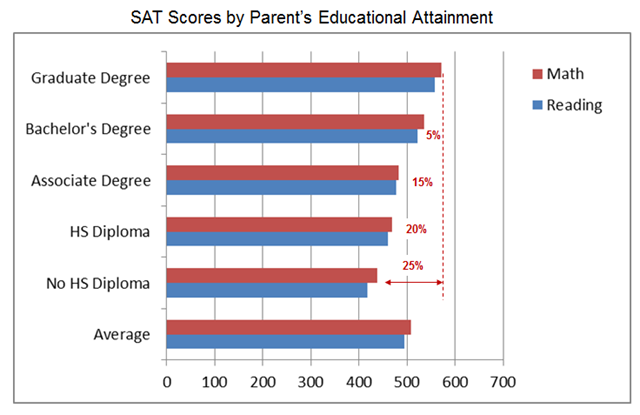 (1) Disproportionately few students whose parents are non-degreed even take the SAT. 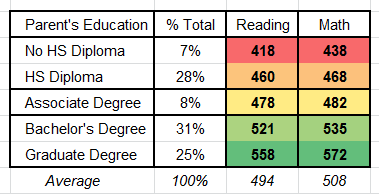 (2) And, those who do, have a big scoring gap against students coming from degreed homes. Explanations range from DNA to family resources (for better schools and test prep) and parental study help – either help with the material or motivation & discipline. But, the latter – motivation & discipline – doesn’t require a high level of education attainment … it just needs parents who value education – whether they have it or not. Case in point: ME ! My dad dropped out of school in the 8th grade to work on the family dairy farm. My mom was yanked from school in the 6th grade to housekeep for her 6 siblings and single-parent father. Both parents survived the Depression. That experience cemented their belief that education matters. The value of education was a dominating core value in my family. Teachers weren’t to be questioned and grades were expected to be high. My math SAT was over 750 … defying the above chart. This entry was posted on November 30, 2018 at 6:59 am and is filed under Education - Academics, Family & Friends, Homa, Ken, SAT - tests. You can follow any responses to this entry through the RSS 2.0 feed. You can leave a response, or trackback from your own site.